I’ve been helping people get things done for … well, let’s just leave that at “a long time”. Because that’s so, I have some observations that time has only made more true. One is that people almost always think of you in the first context they encounter you. And that’s fine if you’re a CPA and never branch out, or a tax attorney, or a brain surgeon. But if you’re a consultant with multiple responsibilities, getting buttonholed like that can be a problem, both for you and your clients. “He’s my geek” means you’re just a geek and people don’t even (usually) know what their geek does! So I was a bit surprised to find out that this idea seems new to … anyone … when I ran across this piece a couple of weeks ago. Digital agencies are struggling with a new market reality? That’s news? If you’ve been marketing yourself as a geek, or a marketing person, or a business consultant, and never noticed that those things became inextricably linked about a dozen years ago, then sure. And as is often so with the less experienced, things that old-timers know can seem like amazing insights. But from here … well, let me illustrate the “he’s my geek” angle with a couple of stories. Back around 1990, I in fact did sell my services as that of “computer geek”. And because the idea of businesses buying, owning, and maintaining computers was new—and expensive—that made sense. Then I noticed that pretty much every client who wanted to “computerize his business” was really asking to computerize his accounting. A business consultant was born. Even before that, in my prior career as a financial consultant, I had a client who—no matter how well I handled his investment portfoloio—thought of me as “his insurance guy”. It drove me crazy; I actually made him more money than he made himself by working but with him I was pigeonholed into a small part of what I “did”. I wasn’t yet a geek of any sort, but this was my first “he’s my geek” moment. And I didn’t like it. Our clients over the last dozen years will tell you that we handle pretty much everything they need. Business-operations-wise, The Answer Guy is your one-stop shop. “He’s my geek”? We actually started discouraging that thought—at all—about ten years ago. As I wrote here some time back, it’s a matter of blurring lines. 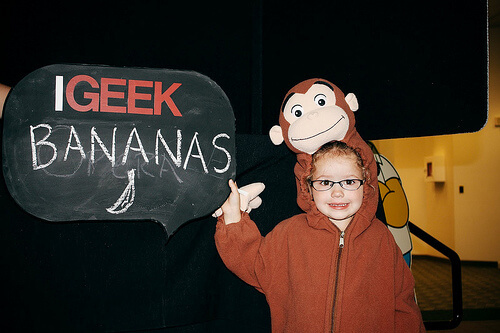 Your SEO isn’t about geekery nearly as much as marketing. Your hiring practices shouldn’t be about fulfilling long laundry lists. And while your real geeks often really are geeks, you’ll get more out of them if they understand business. Take a good long look at your tech guy. If “he’s my geek” is the first thing that comes to mind, he’s doing something wrong.